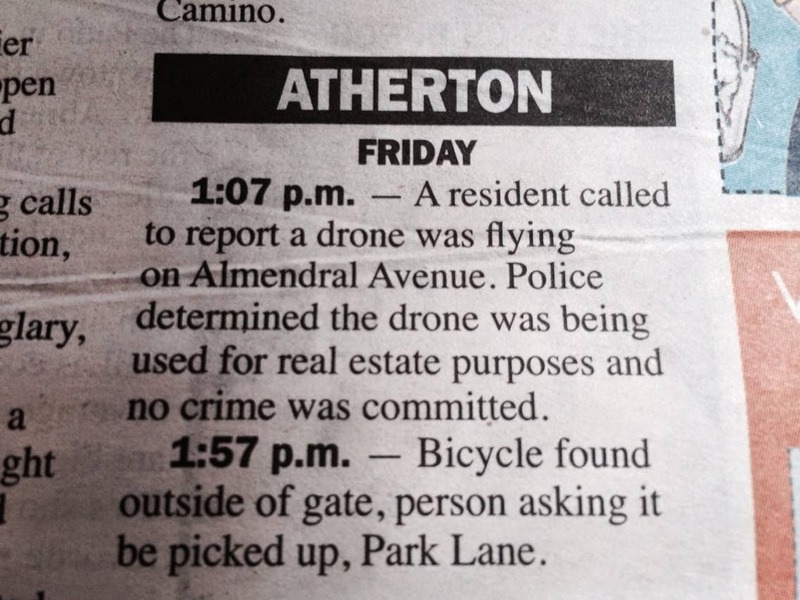 The always amusing Atherton police blotter #firstworldproblems. Thanks to Ellen Levy for the photo! Droning. Apparently everyone's doing it right now. George from Techcam came by our job site yesterday to test out his some of his new services. Here's a video taken from his drone of our job site. We are about a month away from completion so if you know anyone who's in the market for a new home in Palo Alto, please send them my way. You can see the floor plan and more details here. James Witt's last three homes all sold before they were finished. So far we've been holding off on showing this house, but once the floors are in later this week, we'll allow interested parties to take a look. 2014-07-08 Techcam Helicopter Park Finishing from Techcam on Vimeo. In case you're interested, here's a list of TechCam's new services below. As a side note, one of James' construction sites (that wasn't being monitored with cameras) was recently burglarized. He lost several thousands of dollars worth of tools and equipment, so it's well worth investing in some security measures! TechCam has branched out to cover more techie home construction areas, so if you're in need of some expert guidance, I highly recommend consulting George. You can reach him at info@techcam.net. 7. Smart Home Automation - Lights, HVAC, TV, etc.